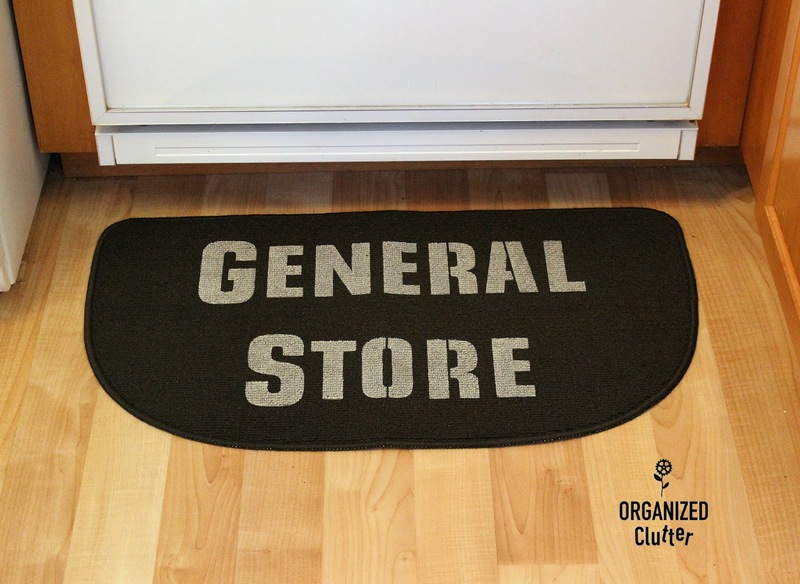 I recently purchased this kitchen rug at Kmart for $5.99. I just received a new stencil in the mail this week! 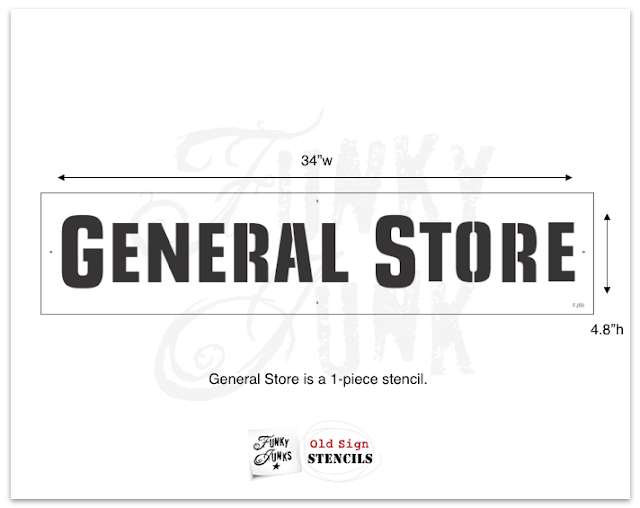 It's the newest stencil from *Old Sign Stencils stencil collection - "General Store". Perfect for a farmhouse/country kitchen. 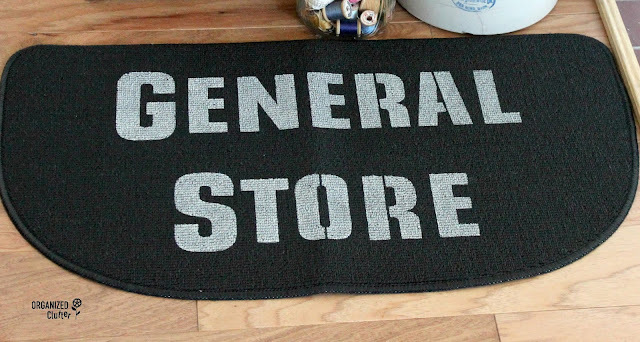 The stencil is wider than my rug, so I stenciled "General" above "Store" on the rug. Always use a ruler and measure to center your stencil! If you stencil looks too high or too low or too far left or right, it will spoil your project. After I was satisfied that there was indeed room for both words, and had measured even margins all around the rug, I taped the stencil on with blue painter's tape. 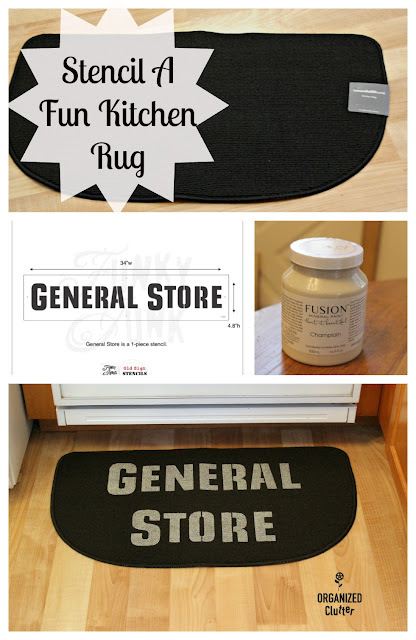 I used Fusion Mineral Paint in Champlain for the stenciling. Fusion Mineral Paint works very well on fabric. After it's cured, it is machine washable. I stenciled tee-shirts with it last summer, and was very pleased with the condition of the stenciling after many machine washings. I then stenciled "Store" onto my rug. I ended up doing a couple of coats to make sure there was adequate paint coverage. I really like my rug! I think this new stencil has some great decor possibilities! You are such a talented gal!! Love every creative thing you do! I get excited every time I get your blog. Stay warm! I love this Carlene! Gotta pick up a few plain mats and play... thanks for the inspiration!